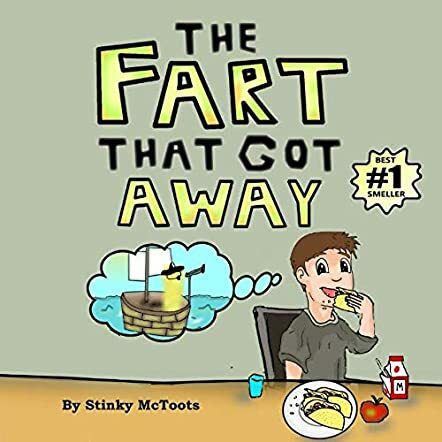 The Fart That Got Away is a hilarious children’s picture book, written and illustrated by Stinky McToots. One Tuesday after eating tacos, a young boy races to the toilet, only to find that the sole thing produced is a noxious gas (aka a fart). The boy’s fart follows him home, where he and his fart play cards and video games together. Other children steer clear of the boy due to the unbearable stench, until a strong wind creeps up on him while playing outdoors and carries the fart away. In a dream, the fart tells the boy to talk to and become friends with the other children, and that the two of them would reunite the next time the boy eats tacos. This extremely entertaining title (written by an author with an equally entertaining name) brought about quite a few chuckles and eye-rolls – the typical adult reaction to fart jokes and stories. Both the tale and the illustrations depicted in The Fart That Got Away are clever and will be sure to gain the full attention of readers of all ages. I was easily able to visualize many of the descriptive parts of the story which were not depicted in the illustrations, something I am not so proud of, but it does show the true talent of Stinky McToots’ writing prowess. I was also able to empathize with the young boy at the loss of a friend when the wind blew the boy’s fart away (yes, I really just wrote that) and feel that The Fart That Got Away will be a book which is read time and again by readers aged 5 to 12, as fart stories simply never get old. Not only do people find the sound of a fart funny, but also the stories – such as The Fart That Got Away – which come of them.